Fine Art Limited Edition of 10. 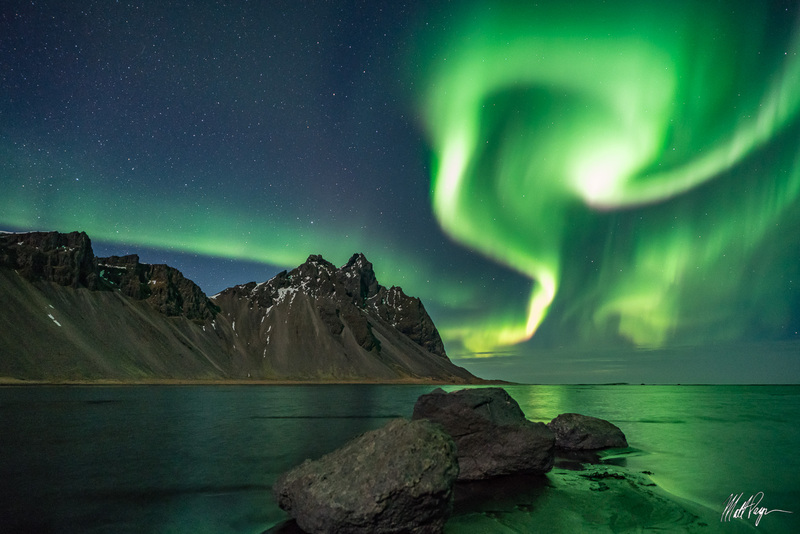 A magical strand of Aurora over the mighty snow-capped mountain Vestrahorn in Iceland. This mountain is right against the ocean and after high tide recedes, a large pool of water remains, creating amazing reflections in the water. This night was so amazing - perhaps one of my favorite moments of my life as a nature photographer. The Aurora just danced over our heads between the stars as we stared up at the heavens in awe. This nightscape for me represents power, awe, and great vibes. Stokksnes is a headland on the southeastern Icelandic coast, near Hofn and Hornafjördur. The H3 Radar Station is located at the tip of the headland. The Iceland Air Defense System uses the station to monitor Iceland's airspace.